The Customer Service Call Center Resume is designed for those who need to supplement a definitive work history that does not quite stand on its own with additional sections to highlight skills or other attributes a potential employer may find attractive. This is ideal for a job applicant who has only worked in one or two places or has only been in a customer service call center environment for perhaps only a year or so. However, this may also be tailored if one has years of experience or barely any at all by simply adjusting the size of each section’s content. The Customer Service Call Center Resume will require the job applicant to supply their own entries but will give a very clear format to do so. 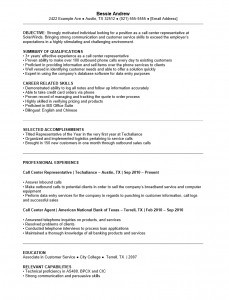 This level of organization is the true power of the Customer Service Call Center Resume Template. Step 1. 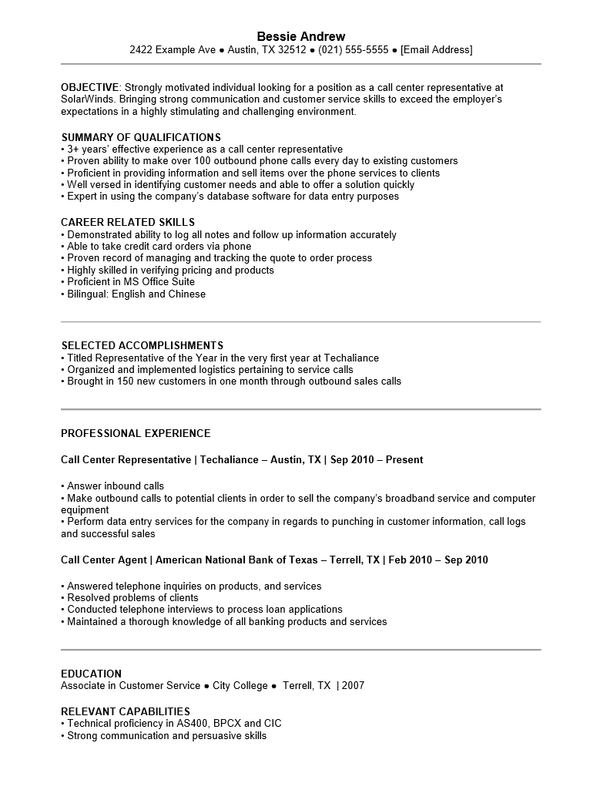 The first section of the Customer Service Call Center Resume Template to be filled out will be the Name and the next will be the Contact Information. The Contact Information should be current and accurate. This should include the mailing address, phone number and email address. Both the Name and the Contact Information should remain at the top of the page but may be aligned according to the candidate’s taste and style. Step 2. The Next Section to be filled out is the ‘Objective’ section. Here, write a brief naming the desire to obtain a specific position and what may be brought to the table. This section is meant to attract the recruiter to continue reading to through the resume so it should be polished. Step 4. The ‘Key Skills’ is also a list. Make a list of personal skills and abilities that will useful in the position being applied to. Step 5. Fill out the ‘Accomplishments’ Section with history of achievements or notoriety that have been earned in previous positions. Step 6. Select one or two subjects to close the resume. Typically this may include ‘Education’ and/or ‘Relevant Capabilities.’ In the ‘Education’ section list the institutions attended, dates attended, and certificate earned. If closing with a ‘Relevant Capabilities,’ make sure to be very aware of what the job description states. This sections should address only skills that apply to those demanded in the description for the desired position.